Golub, Alex, Daniel Rosenblatt, and John Kelly, eds. A Practice of Anthropology: The Thought and Influence of Marshall Sahlins. Montreal: McGill-Queens University Press. This collection brings together some of the world’s most distinguished anthropologists to explore and advance Sahlins’s legacy. All of the essays are based on original research, most dealing with cultural change – a major theme of Sahlins’s research, especially in the contexts of Fijian and Hawaiian societies. Like Sahlins’s practice of anthropology, these essays display a rigorous, humanistic study of cultural forms, refusing to accept comfort over accuracy, not shirking from the moral implications of their analyses. Contributors include the late Greg Dening, one of the most eminent historians of the Pacific, Martha Kaplan, Patrick Kirch, Webb Keane, Jonathan Friedman, and Joel Robbins, with a preface by the late Claude Levi-Strauss. Golub, Alex. 2014. 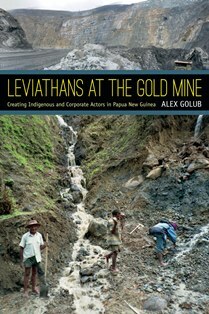 Leviathans at the Gold Mine: Creating Indigenous and Corporate Actors in Papua New Guinea. Durham, NC: Duke University Press. Golub, Alex. 2001. Gold Positive: A Brief History of Porgera 1930-1997. Madang: Kristen Press. Golub, Alex. 2014. The anthropology of virtual worlds: World of warcraft. Reviews in Anthropology 43 (2): 135-149. Golub, Alex and Mooweon Rhee. 2013. Traction: The role of executives in localising global mining and petroleum industries in papua new guinea. Paideuma 59:215-236. Golub, Alex. 2010. Being in the world (of warcraft): Raiding, realism, and knowledge production in a massively multiplayer online game. Anthropological Quarterly 83 (1): 17-45. Golub, Alex. 2007. Ironies of organization: Landowners, land registration, and papua new guinea’s mining and petroleum industry. Human Organization 66 (1): 38-48. Golub, Alex. 2006. Who is the “original affluent society”? Ipili” predatory expansion” and the Porgera gold mine, Papua New Guinea. Contemporary Pacific 18 (2): 265-292. Golub, Alex. 2014. The history of mana: How an austronesian concept became a video game mechanic. The Appendix 2 (2): 27-37. Golub, Alex. 2013. Anthropology, footnoted (a review of Jared Diamond’s The World Until Yesterday). The Appendix 1 (2): 142-147. Friedman, Kerim, Chris Kelty, and Alex Golub. 2008. Three years of savage minds: From blog to scholarly civil society. Anthropology News.